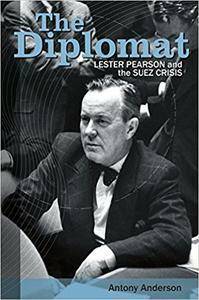 Antony Anderson, "The Diplomat: Lester Pearson and the Suez Crisis"
Lester Pearson, Canada's foreign minister (and future prime minister) stands before the United Nations General Assembly. He is about to speak, reading from a proposal composed of seventy-eight painstakingly chosen words. These words, shaped by caution and hope, are a last-ditch attempt to prevent a conflict in Egypt from igniting a conflagration throughout the Middle East. Pearson, in perhaps his finest hour, is about to carve out a razor's edge of common ground to bring together angry allies and bitter enemies by suggesting and making possible the creation of the first UN peacekeeping force.